In fulfilling his duties as Mr. Congeniality, Gov. 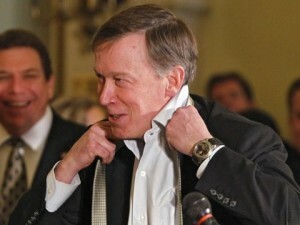 Hickenlooper will speak at the Democrat’s dog and pony show, also known as their national party convention next week. We don’t expect he will pull a Ted Cruz and refuse to endorse Hillary. Afterall, Hick and Colorado Democratic insiders went to a lot of trouble to steal the final state vote results from Bernie Sanders and deliver it to Hillary. However, it’s possible, and our fingers are crossed, that Hick would be booed by Bernie Sanders’ supporters for doing just that. Despite the media hype that violent protests were expected to break out at the Republican convention this week, no such anarchy occurred. The same may not be true for the Democrats, who have also invited state House Majority Leader Rep. Crisanta Duran of Denver to threaten speak. Then there was the time she hinted at violence against her opponents when she tweeted that women should buy guns, in response to an appropriations meeting that didn’t go her way. “The stakes in this election are high, and it’s critically important that we unite around our shared principles as progressives to keep the White House in Democratic hands,” Duran said. It would be really great if Democrats would buck the shared principle that seems to be growing among their ranks, and that’s violence against their political opponents.